The Vanderbilt graduate also took road trips up and down the coast, selling to galleries and stores; after two years of trips she had placed her jewelry in 80 stores throughout the Southeast. "I vowed that I would figure out a way to make it a career," recalls Tiller, 38. Still, Tiller was wary of taking the next step. "I almost wanted the rent to be too expensive and the lease to be too long," says the Charleston native. "But everything fell into place -- space, layout, costs, terms -- so I said, 'Damn, I guess I have to do this.'" 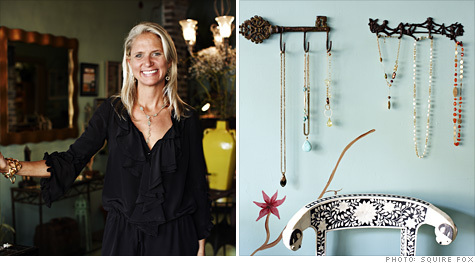 Business took off after she opened Filigree, her brick-and-mortar store, in 2001. She grossed more than $200,000 in each of the first two years. Her business plan changed when her son, Whit, was born in 2003. Tiller didn't stop working, but she did trim her hours to fewer than 40 per week. Today her annual sales hover around $150,000, but Tiller is now a mother of two (daughter Eva Gray was born in 2006) and is quite content with her current work-life balance. "I'll work more when my kids are both in school," she says. Tiller still attends national gem shows and scours local antique markets, partly for inspiration and partly to find vintage pieces that she can update. Last year she discovered a Chanel chain that has inspired an entire line of jewelry. "I use the Chanel chain in a lot of my pieces," she says. "I really love the vintage look mixed with a modern edge." The neighborhood could be described in the same way. Since Filigree first opened, the area has evolved from a neglected, gritty quarter into the Design District -- a close-knit community of artists and entrepreneurs who run boutiques, shops and restaurants. It has become Charleston's hip shopping destination. "I look forward to coming to work every day," Tiller says. "The owners of the salon next door are like family. We have keys to each other's stores." There have been times when Tiller has closed up and her neighbors -- seeing a window-shopper outside Filigree -- have opened the shop and turned a casual browser into a paying customer. "They'll call me when I'm at home eating dinner," Tiller says, "all excited that they made a sale."